Wanna have everything you need to grill at your fingertips? AND have room to set things while you are at the BBQ? 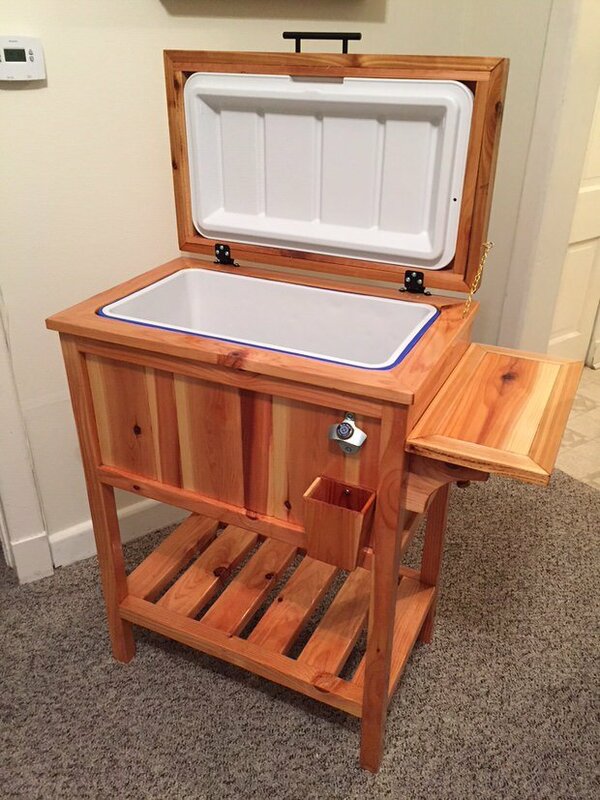 This rolling DIY outdoor kitchen has complete building plans and instructions, from Elisha at ‘Pneumatic Addict‘. This one has it all, and it rolls out of the way when not in use too! 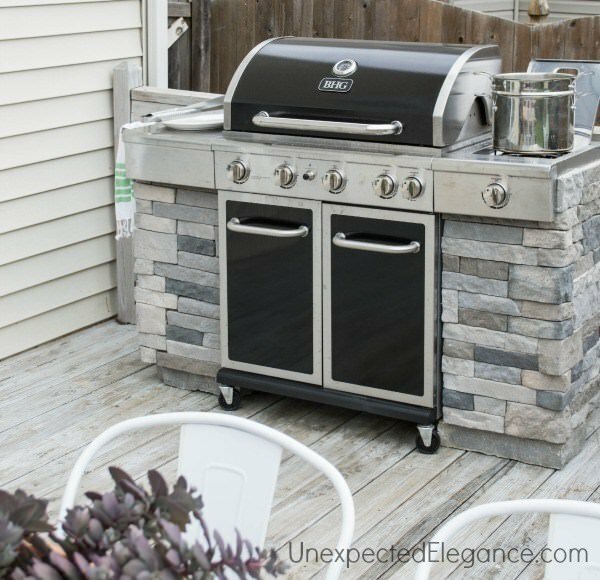 This DIY grill station from Angela at ‘Unexpected Elegance‘ is ah-mazing! Why? She not only made it practical, it’s pretty! She used stone veneer over a sheet metal frame that she created herself. 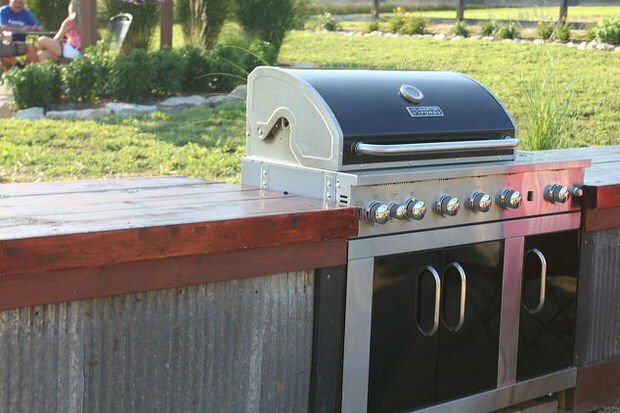 DIY outdoor kitchens are a lot of value for a weekend project! Easy instructions with photos. From ‘Old World Garden Farms’ via ‘Hometalk‘, this rustic outdoor summer kitchen is the perfect look for a farm style home. (Or one where you just want to add some rustic charm!) 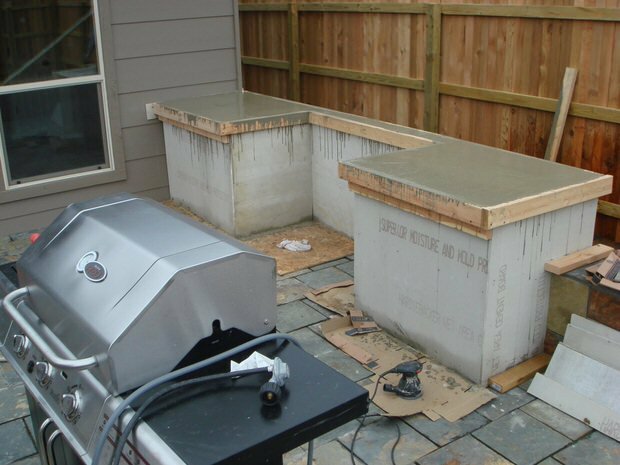 Photos and instructions fro this DIY outdoor kitchen. We are loving’ on that corrugated metal! 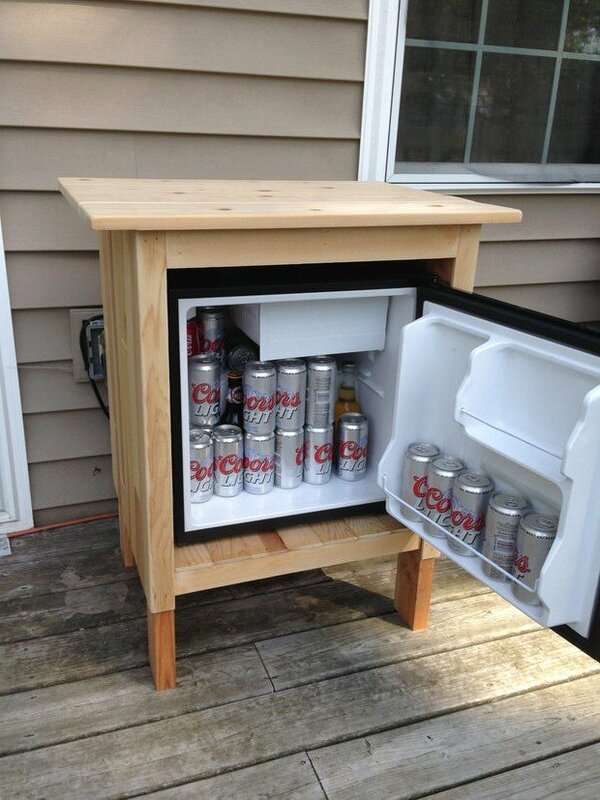 This patio cooler stand from ‘Eddie and Steph‘ is a great idea, with a short little tutorial. 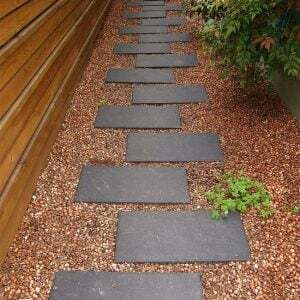 A DIY’er with some projects under their belt could take this idea and make it amazing! There is nothing worse than having to go inside every 5 minutes for more drinks! These DIY outdoor concrete countertops are kind of a two parter… The actual concrete counter how-to is from ‘Kara Paslay’, but you will find a general tutorial on making a countertop for outdoors at ‘HomeDit‘. This is a more permanent outdoor kitchen design that can add value to your home. 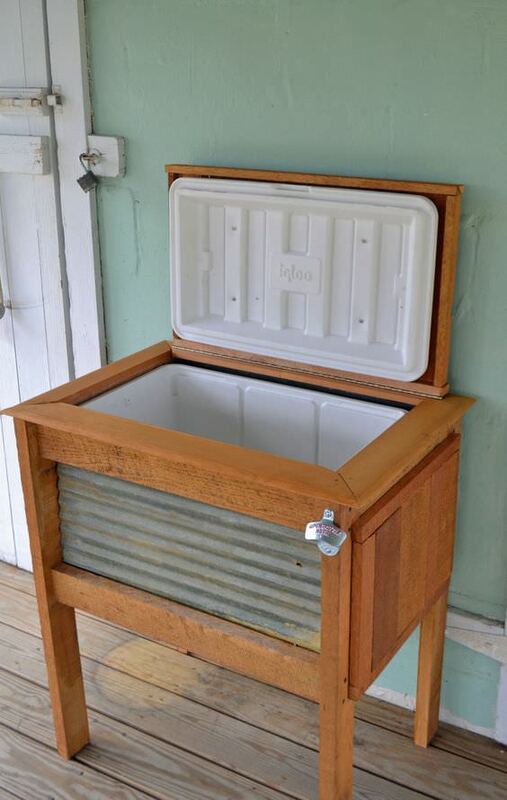 This last one is a wooden cooler stand from ‘Ana White‘ done by ‘Birds and Soap, and this time, we found the tutorial to make this outdoor cooler project. Be sure to scroll down to find the drawings and plans. Which version would you make? If you want to create your own outdoor kitchen but these projects aren’t in the cards right now, may we recommend checking out these outdoor grill stations and bar carts at Wayfair. They have a ton of grill carts, outdoor kitchen supplies and outdoor sinks and bars that could be put to really good use in mine and Steve’s patio right now! My fav? (And the one on my Mothers Day list? 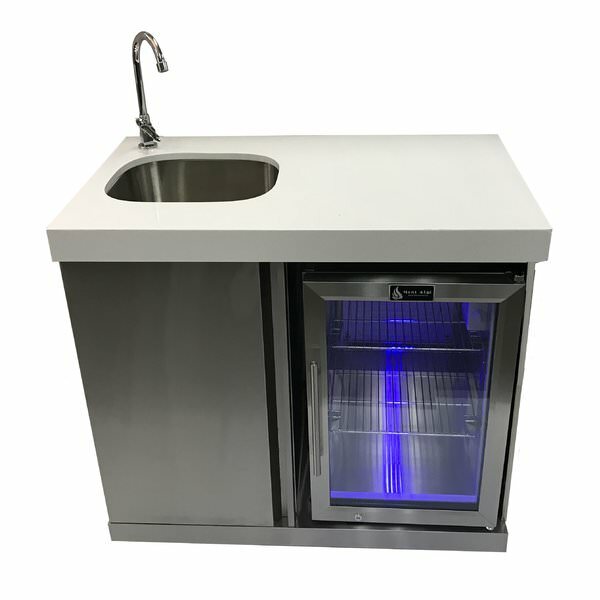 ;)) This outdoor bar center with sink and fridge. Roll up the grill and we would never have to go inside! 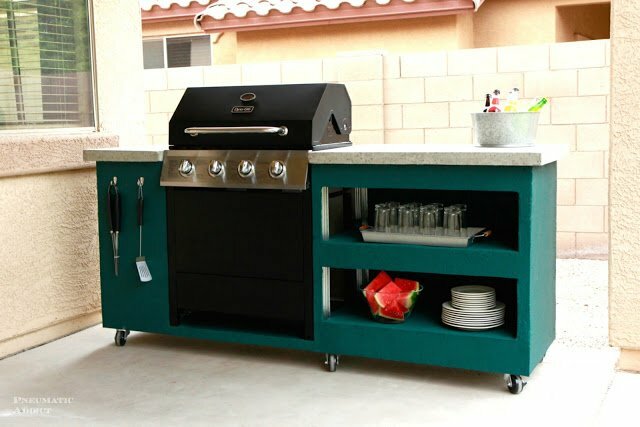 If it’s time to be outdoors, then you need to make these DIY Outdoor Kitchens and Outdoor Grill Stations! 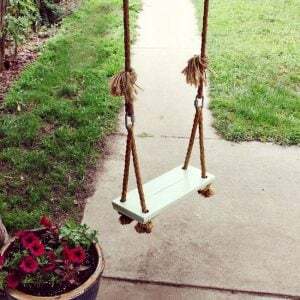 When you are done with that, check out our posts on DIY Outdoor Dining Tables and 13 Projects for Backyard Relaxation! Look so awesome Kathy. 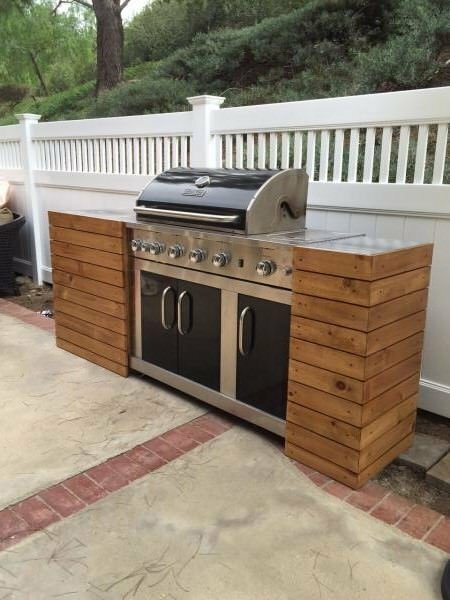 My friends will be very jealous if they know I have an amazing outdoor kitchen or grilling station like this. I absolutely want to try this but winter is coming now, I wish i can’t found your post earlier. So I guess I will bookmark your post and waiting for warm season.Thanks for sharing us cool tutorials you found on the internet.